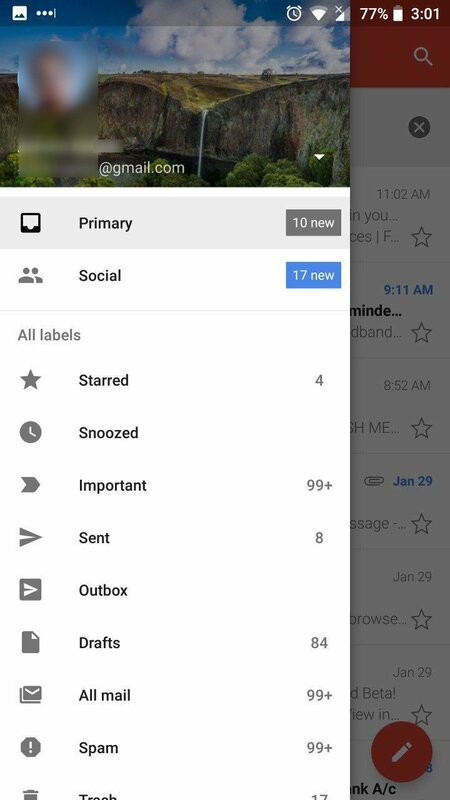 Google has announced a new Gmail Android app theme, and it is an all-white theme. Here is what it looks like. Well, it is white, so white, it is going to hurt people’s eyes. It looks more iOS-ish than Android doesn’t it? It doesn’t look bad per se, but is awfully bright. The old compose button has been replaced with a Google-coloured + button. 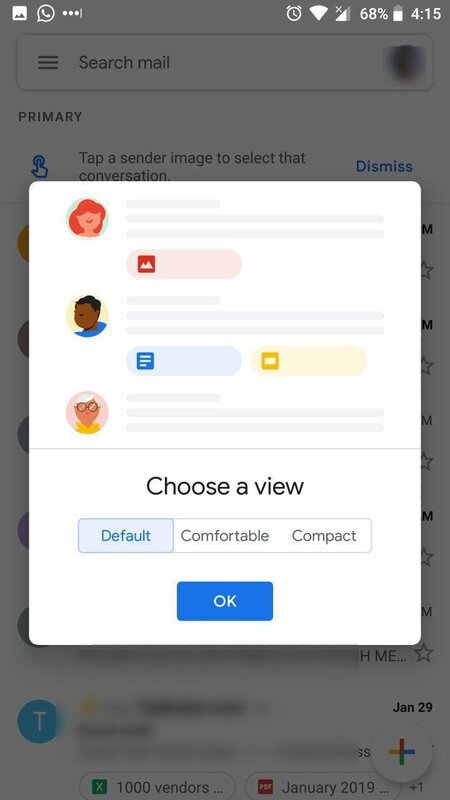 The new Gmail Android app theme white isn’t the only thing that’s new in the app, it supports Smart Compose, Smart Reply which use machine learning which adapts based on your writing style to help you create drafts and replies faster. The app also has a reminders feature which will notify you about important conversations. The attachment preview displays attachments before you even open the mail. 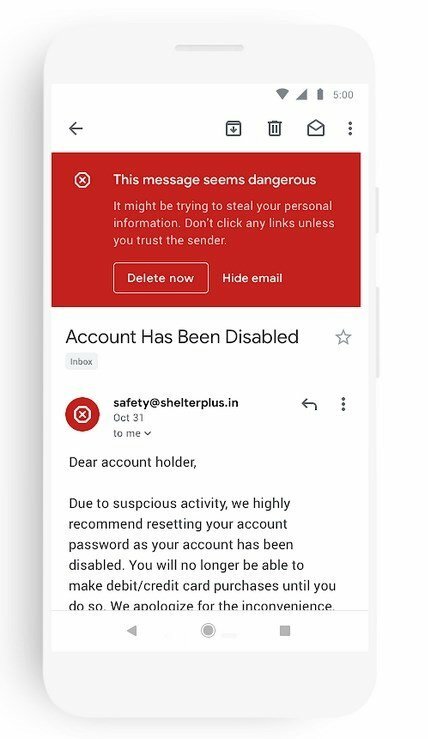 Scam and dangerous messages are now flagged with a giant red warning banner to alert you about phishing and malicious content. 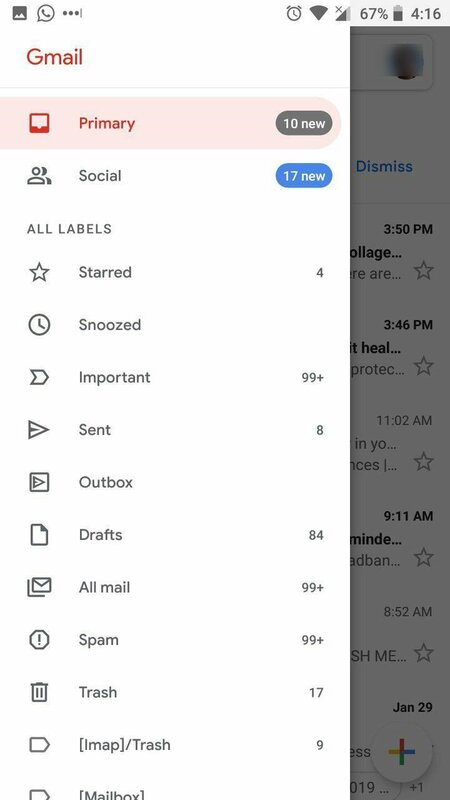 The red bar from the previous version (v8.1) is gone in the new Gmail Android app theme, and instead you have a search bar which is, also white. The side-bar is, you guessed it, white. 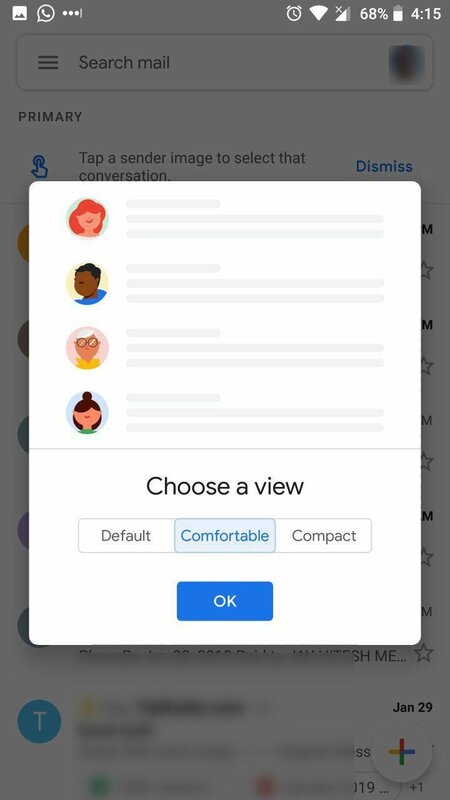 When you update to the new version, you will be asked to choose between three views: Default, Comfortable and Compact. You can tap any option to see a preview of it, before selecting ok. The Default view has extra spaces, and displays the sender’s photo, as well as a preview of the attachments in the mail. 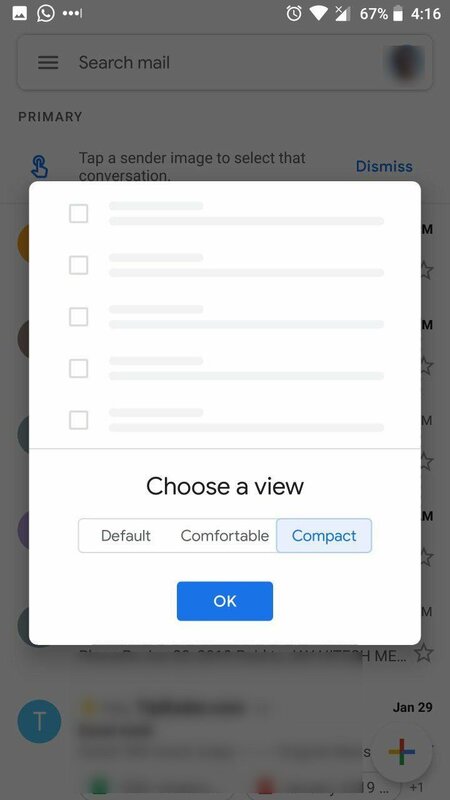 The comfortable view kind of looks like the previous version’s default view. The compact view skips all extra details (no pics, attachment icons) and sort of lists the mails in a text style. The new Gmail Android app theme arrives in version 9.1.13.231319729. That’s very catchy isn’t it? 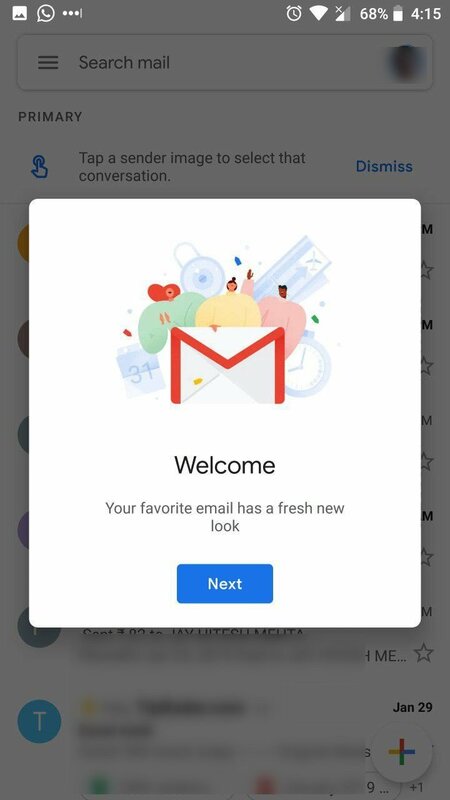 If you are wondering what the last version of the Gmail app was which had the old theme, it is Gmail 8.12.30.230564275. Save a copy of the APK and you should be good to go, in case you don’t like the new version. 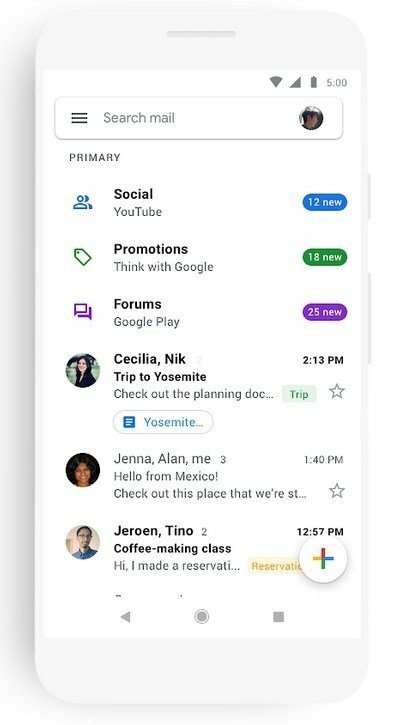 All things said, here is the question: Ok Google, where is the dark mode for the new Gmail app?